James Reimer has played 9 games in his NHL career. He's sporting a sweet .940 SV% and a fantastic 1.96 GAA. You may have heard he recorded his first shutout the other night over Carolina. When the Leafs drop the puck in Buffalo tonight, all eyes will be on the 22-year old Winnipeg native between the pipes. 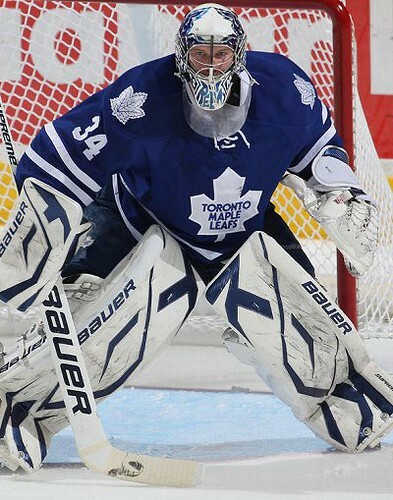 In a Leafs-crazy city, desperate for hope and something to cheer for, James Reimer already owns this town. Owning this city is easy... it only took King James 9 games. I'm not complaining. This is fun. In King James we trust. HOPE, HOPE & more HOPE. He is only a good as players in front of him which most are well below avg. This looks possibly like another Raycroft no DOUBTER to take us to the promise land - the plyaoffs. The Toronto Mike curse shall ride again. Toronto Mike curseis right. Whenever you write something like this...it always backfires. Stop it! I'm starting to think this blog is the reason we haven't played a playoff game since 2004. Ya Pogge'd the new kid. That's great. The Leafs lost. I hate them so that's good that they lost. My Habs won. My Habs won 2 to 0 earlier. See who the better team is, my Habs. Cheer for a good team, the Habs. Go Habs. This was not your fault. Do you know how many average goalies have good stretches??? Especially to start a career? I wish it was as easy as King James coming to the rescue, but alas it is not. It's plain and simple. My Habs are a much better team. They can win and win. The Habs are a lot better than the Leafs. Habs Rule. Leafs Drool. Check out TSN or Sportsnet werbise today. Phil looks like he wants out as he doesn't talk to Ron. Phaneuf same. Phil or Ron goes?? Very interesting comments from Phil... I don't think he wants out, but he did give up his coach. IMHO, Wilson's on borrowed time as it is. I'm hoping there's a new voice behind the bench next season, and I'm hoping Phil doesn't have issues with the new guy. Folks are going to start labelling Kessel as uncoachable. Amen Mike. Ron has got to go but Phil has to mature also. Problem with Brian & Ron's personal friendship!! Ah Sherell (Cherrie, Shirley, whatever?) ..........Your astute comments never cease to amaze me. You must spend hours thinking out the important things in your life! I admire your ineptitude. Well, my Habs lost today. That was no good. Just wait and they'll beat the Leafs on saturday. Go Habs.